Lot 12. A famille rose hong bowl, Qianlong period, circa 1785;12 ¼ in. (31.1 cm.) diameter. Estimate USD 40,000 - USD 60,000. Price realised USD 75,000. © Christie's Images Ltd 2019. 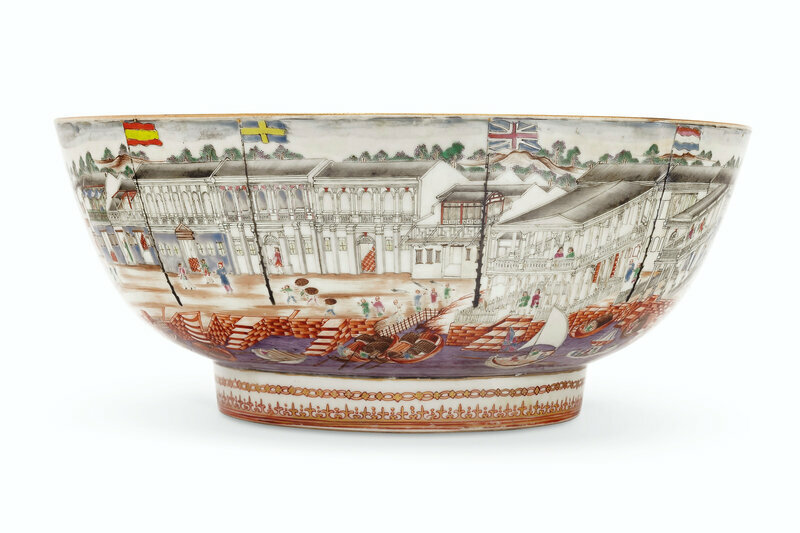 Enameled around the exterior with the foreign factories, or "hongs", along the Canton waterfront, small Western figures seen strolling in the courtyards or conversing on balconies and junks plying the purple water, flags of Spain, Sweden, Great Britain, the Netherlands and Denmark flying, the Dutch folly fort rounding out the scene, the interior painted with a basket of flowers. Provenance: With Rodrigo Rivera Lake, Mexico City. 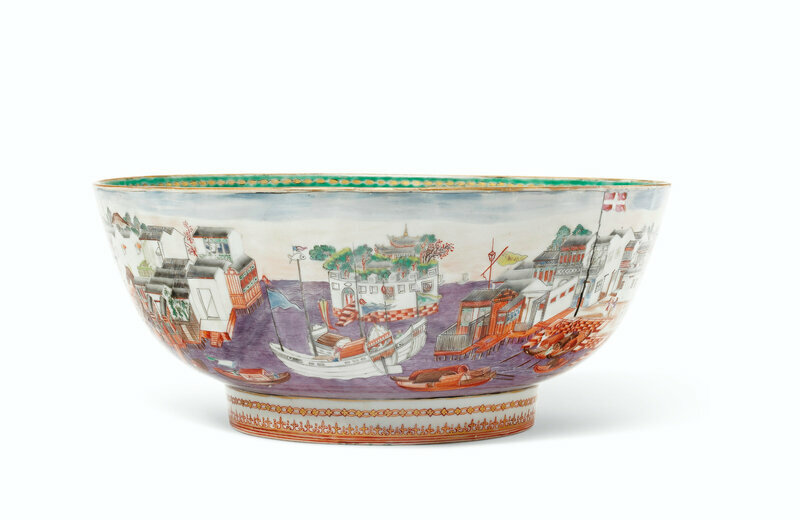 Note: The iconic 'hong' punchbowls, with their lively depictions of the Canton waterfront buzzing with the activity of Chinese and foreigners alike, must have been among the most extraordinary souvenirs available to Western visitors in the China trade period. Depictions of the hongs appear on porcelain from about 1765; at first showing the scene in two large panels. Continuous views like we see on this example seem to date from about 1780. Kee Il Choi has written of the conundrum of the Chinese artist who needed to transfer an essentially rectangular landscape image onto a circular bowl, pointing out that one solution, as we see here, was to insert the Dutch folly fort in the water at the start and finish of the waterfront. 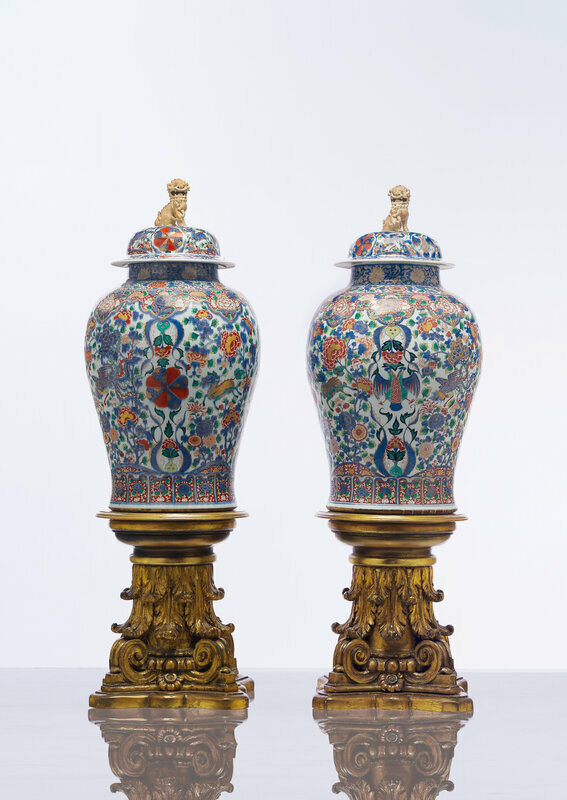 Compare with a 'hong' bowl of similar size and composition in the collection of Benjamin F. Edwards III, sold Christie's New York, 26 January 2010, lot 51.